Do you know the feeling when you see something new for the first time and you are asked to taste or try it? Some of us are very good at trying and experimenting with new things and some are a bit careful and hesitant 🙂 When someone asked me to drink coconut water from a can, I was very hesitant, but I had a sip. I didn’t like it at all!! 1. Coconut water also known as coconut juice is pure liquid you find inside the coconut. It is the most popular beverage consumed in the tropical countries. Women are encouraged to drink it during pregnancy and nursing so their milk will provide all the nutrients necessary for their baby. 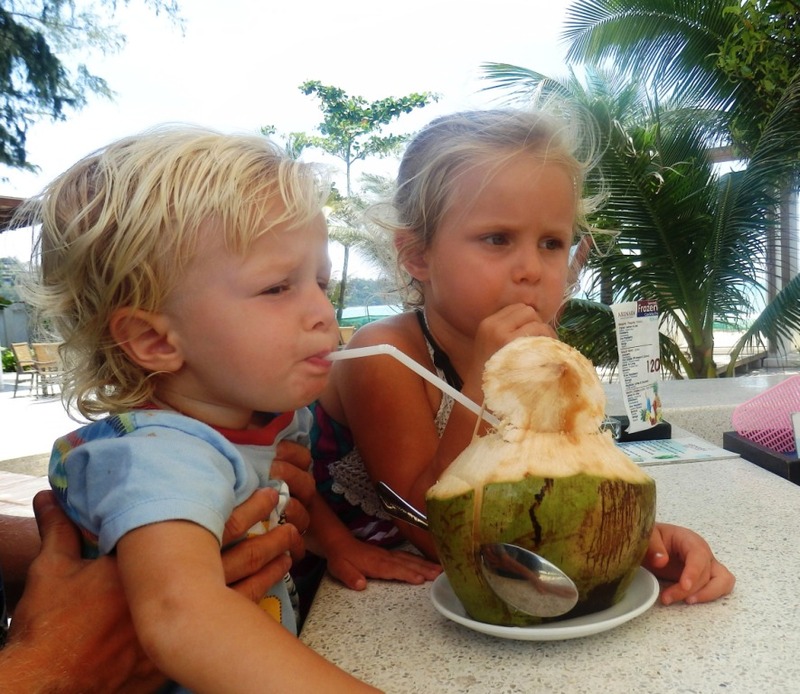 The first food an infant receives as it begins weaning is coconut water and coconut jelly (soft immature coconut meat). 3. Indigenous people from tropical regions have been aware of coconut water health benefits for centuries and drank it to gain vitality and boost immunity. Laboratory studies of organic compounds found in coconut water conclude that the beverage contains properties that can significantly benefit and dramatically improve one’s health. Moreover, coconut water is 100% natural, completely free of chemicals and kept perfectly sterile (free from harmful bacteria) by an impenetrable shell making the water safe for people of all ages, including babies. The lauric acid found in coconut water is identical to that found in human breast milk. 4. Coconut water quickly loses most of its nutritional characteristic and starts to ferment after exposure to air. To maximize health benefits, it is best to drink coconut water fresh, right after the nut has been cracked open. Fresh coconuts are widely available throughout South East Asia, Pacific Island or the Caribbean and are very inexpensive. Vendor would slice small opening into the shell of the drupe with a machete, exposing the water inside. You can easily and comfortably drink the water with a straw. If the coconut is cracked open upon your purchase, the freshness is guaranteed. Put the straw in and drink it in small gulps right away, enjoying the refreshing taste and instant boost to your body and your spirit. cytokinins (e.g. kinetin and trans-zeatin) found in coconut water have significant anti-ageing, anti-carcinogenic, and anti-thrombotic (anti-clot formation) effects. coconut water has been generally offered to patients with diarrhea in many tropic regions to replace the fluid loss from the gastrointestinal tract and to reduce the need for intravenous therapy. The osmolarity of tender coconut water is slightly greater than that of WHO recommended ORS (Oral Rehydration Therapy) solution. Presence of other biological constituents like amino acids, enzymes, minerals, and fatty acids may account for this higher osmolarity. Nonetheless, unlike WHO-ORS, its water is very low in sodium and chlorides, but rich in sugars and amino acids. This well-balanced fluid composition, along with much-needed calories, would be an ideal drink instead of any other kind of soft drink beverages to rectify dehydration conditions. coconuts despite being very light in consistency, its water has proportionately better composition of minerals like calcium, iron, manganese, magnesium, and zinc than some of the fruit juices like oranges. coconut water contains very good amount of electrolyte potassium. 100 ml of water has 250 mg of potassium and 105 mg of sodium. Together, these electrolytes help replenish electrolyte deficiency in the body due to diarrhea (loose stools). fresh coconut water has a small amount of vitamin-C (Ascorbic acid); It provides about 2.4 mg or 3% of RDA. Vitamin C is a water-soluble ant-oxidant.